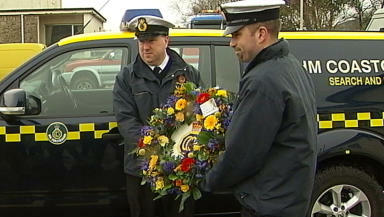 Three ferrymen and three coastguards died in stormy seas off Inverness in 1894. A ceremony has been held to mark the 120th anniversary of the Kessock ferry tragedy, in which three ferrymen and three coastguards drowned in stormy waters just off Inverness. It is the first time in recent memory that an event has been held to mark the incident, which left 26 children without a father. In sight of the Kessock Bridge coastguards and relatives gathered to remember six men who lost their lives on a stormy night in the Beauly Firth. Until the crossing opened in 1982, people travelling between the Black Isle and Inverness relied on a ferry boat. But on the February 23, 1894 an evening sailing turned to disaster when three ferrymen became caught out by a heavy storm. Coastguards went to their aid but six men perished after their rescue vessel overturned, just yards from shore. Those who died were ferry men John MacDonald, John Mackenzie and skipper Murdo MacLeod and coastguards William Hobbs, Ruband Staite and James Kilby. Relatives of some of the men took part in the ceremony, laying a wreath on the waters as the victims' lives were remembered.